When it comes to the post production stage of making your video, it can become quite stressful. You’re sat in front of a computer screen with hours worth of footage and are expected to not only condense your content into a couple of minutes but to also make it coherent, capturing and creative. Oh and not to forget it has to hit the brief you gave your client perfectly. It’s hard not to get stressed when you consider all of these aspects, essentially the whole video is riding on you, because no matter how cinematically it was shot or how well conducted your interviews were, it all boils down to your construction. Organising your footage into bins – Having a clean project space to work within makes the world of difference, especially if there are a number of aspects to your video. For example, if you’re editing your typical promotional video, you’d have a bin for your interviews, a bin for your cutaway footage, a bin for any additional audio or add ons like a logo. Basically if you can give it a bin, give it a bin! Create a to do list – Making a to do list will enable you to work through your project more effectively. Try to break your list up into segments and don’t concentrate on one aspect for too long, mix it up. That way you won’t get hung up on a certain section and you’re less likely to get distracted. Take a break – Its easy to get sucked into your project and not peel yourself off of your chair until your project is done but it’s important, for a number of reasons, to take a break during the editing process. When I say take a break I mean get up and actually leave your computer for 10 minutes, it’s good for the brain to stop itself from overthinking and stressing about things you wouldn’t normally worry about. 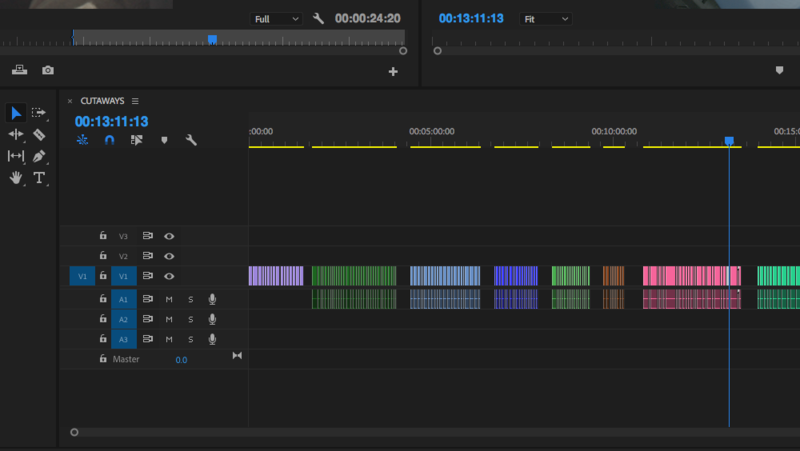 Utilise your editing softwares organisation features – These may vary depending on the software but with Premiere features like markers and labels are a great way to keep your editing stress free. Use the markers to note any key content you may want to go back to later, this is especially useful to know when cutting interviews. The labelling feature is also great if you have a wide range of topics to be covered or a variety of different cutaways that you’d like to group together. By labelling these groups with a colour you’re able to access the stuff you want at a much quicker pace which inevitably stops the stress of sifting through mountains of footage. Hopefully these steps will help you like they help me during the editing process because editing should be anything but stressful!